Supplement paste for horses, ponies and donkeys. Nutritional worming supplement paste for horses, ponies and donkeys. Vermi Minus promotes good intestinal health. Thanks to its composition of Boldo, Lemon, Eucalyptus, known for their worming virtues, VERMI MINUS paste relieves horses from too large number of parasites living in their intestines. The alliance of Lemon and Eucalyptus (anti-spasmodic, anti-diarrhoeal, anti-septic, wormer, anti-parasitic) makes VERMI MINUS paste an effective, non-aggressive product for horses’ intestinal systems. It does not leave them weak and sensitive to viruses orbacteria. Boldo increases this effectiveness through its diuretic and liver decongestant properties. It makes the elimination of parasites which escape towards the liver and kidneys more certain. Eucalyptus then enables the healing of any lesions caused by parasites. Furthermore, Boldo, Lemon and Eucalyptus stimulate the horse’s organism so it feels no effect of worming. 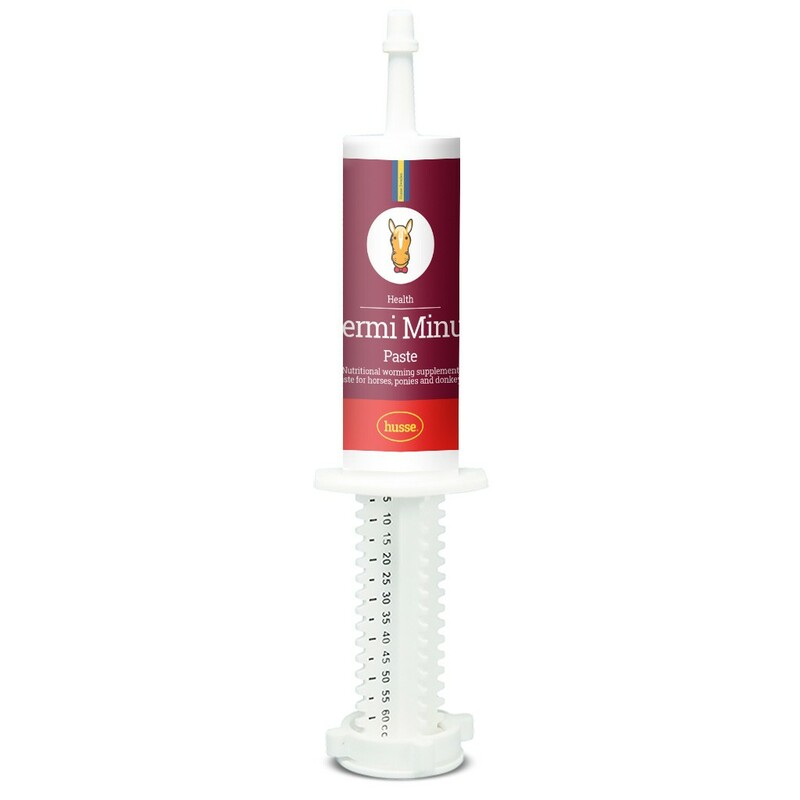 Use of VERMI MINUS paste is aimed at maintaining the horse’s intestinal balance and not entirely eliminating the fauna, which would be detrimental to the animal. It is therefore possible to find parasites in the dung despite regular use of VERMI MINUS paste through the year (3 to 4 times). However, certain parasites are more persistent and require a 2nd treatment with a double dose. Thanks to its dispenser, VERMI MINUS paste takes up little space. It can be taken everywhere and be given directly in the horse’s mouth whenever and wherever and is ideal for difficult horses. Horses/ Mares/ Large Ponies: 30 ml, repeat after 8 days. Ponies/ Foals:15 ml, repeat after 8 days. Can also be given in a single dose to grazing horses (horses: 60ml; foals: 30ml). Herbal treatment which contains a powerful combination of herbal extracts from selected plants, in particular Boldo, Lemon, and Eucalyptus.